There are a lot of tools out there for finding out whether your identity has been compromised. But the price of that eternal vigilance can put a serious crunch on your time—assuming that you even know where to find all those tools to guard against identity theft. AllClear ID knows. The company works in the identity theft protection business, notifying customers on behalf of other companies when there’s been a security breach that may have compromised sensitive data. Now AllClear ID is taking that service directly to consumers in the form of an iPhone app that provides alerts about potential identity theft problems. The AllClear ID mobile app made its debut Wednesday in the App Store. It promises to alert users whenever there’s a report that thieves may have accessed their bank accounts, credits cards, or Social Security number. AllClear ID’s free mobile offering also includes a number of identity protections, among them the ability to order a credit report, reduce junk mail, and set up credit fraud alerts. That’s where AllClear ID comes in. The company has a new partnership with the National Cyber-Forensics and Training Alliance, a partnership between private industry and law enforcement to keep tabs on cyber-crime and fraud. 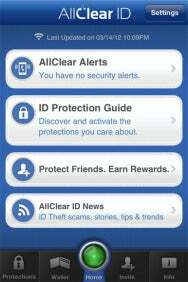 The NCFTA monitors security breaches, and AllClear ID is tapping into that to send alerts to mobile users. Getting started with the app takes a matter of minutes. You enter your name, email address, mobile number, and date of birth. You also create a password and a four-digit PIN to access the secure parts of the app. 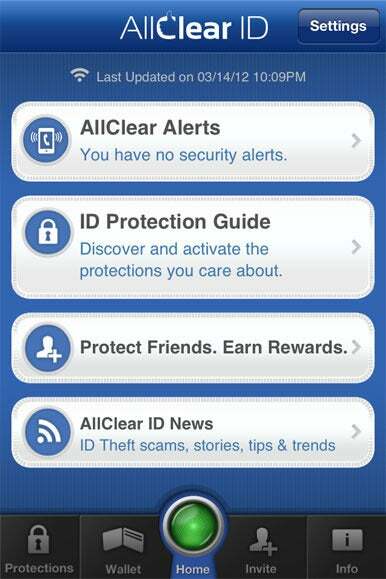 The first thing you’ll want to do with the app is set up AllClear alerts to notify you of any security breaches. AllClear ID has you record your name and a voice key—a phrase of your choosing. When there’s a problem, AllClear ID places a call to your mobile number; should you miss the call, an alert badge will appear over the AllClear ID icon on your iPhone. When the call comes through, you hear your own voice along with the voice key recorded to ensure that the call is authentic; tapping the star key on your phone connects you with one of AllClear ID’s investigators to help you deal with whatever issue triggered the alert. Other identity protections include the ability to monitor credit cards and your Social Security number. You’ll need to provide those numbers to AllClear ID, though none of that information is stored on your phone—sensitive personal data is encrypted and sent to the company’s servers where it’s kept from prying eyes. The credit card and Social Security number tracking features are also optional—and free. “As you build trust in the system, you can add those other data elements,” Holland said. Alerts are clearly the marquee feature in the mobile app, but they’re not the only thing AllClear ID has to offer. The app also functions as an identity protection guide, with links to external resources for safeguarding your financial, identity, and mobile data. The Finances & Records section, for example, can assist you with ordering a free credit report via AnnualCreditReport.com while links to DMACChoice.org and OptOutPreScreen.com help you put a stop to unwanted junk mail and pre-approved credit offers, respectively. The AllClear ID app also includes links to help you review your public records and work history report as well as set up credit fraud alerts and credit freezes. As you set up any of AllClear ID’s assorted privacy protections, the app displays checkmarks—not unlike how a mobile game lists achievements you’ve unlocked. The iPhone & Computer section of the app walks you through enabling a passcode on your phone, recommends antivirus software, and points you toward Apple’s Find My iPhone offering. That section also includes tips on using strong passwords and safe Web browsing. 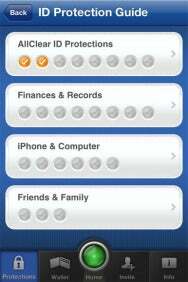 A Friends & Family section includes a link to download the FBI Child ID app for helping parents whose children go missing. The idea, Holland explains, is that these are resources a user can set up when he or she has a few spare minutes. The app’s interface displays checkmarks when you’ve taken advantage of a protection resource, similar to the achievements you unlock when using an iOS social networking app or playing a game. 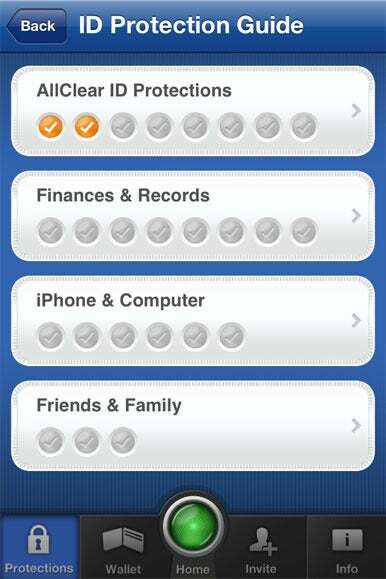 The unlocked achievements aspect of AllClear ID is a particularly clever integration of mobile conventions. While exploring the app, I found other elements less effective. AllClear ID includes integration with Facebook and Twitter, so you can share information about ID protections with others. For an app that places a premium on keeping your private data away from prying eyes, however, I found this integration a little incongruous. AllClear ID also gives users a chance to earn discounts on a paper shredder or a hacker-proof wallet by inviting friends and family to sign up for the AllClear ID service. Bargain-minded users will find this a worthwhile feature that rewards them for bringing an important service to the attention of others; other privacy-minded users may consider this the sort of well-meaning imposition they’re trying to avoid. One thing all users will appreciate about AllClear ID: All of the services outlined above are entirely free. The company does offer a premium service, available as an in-app purchase, that includes lost wallet protection, credit monitoring, and $1 million of identity theft insurance. The AllClear ID Pro offering costs $15 per month.